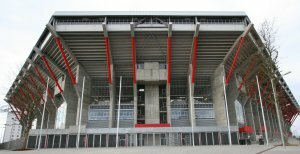 Kaiserslautern hosts four 1st round games and a second round match in the Fritz Walter Stadion - the home of FC Kaiserslautern. Kaiserslautern Accommodation, Kaiserslautern Stadium, Kaiserslautern Tourism. Kaiserslautern's Fritz-Walter Stadion (seating capacity of 41,513) is named after the club's most famous player; who also captained the 1954 West Germany side that beat Hungary (3-2), to win the World Cup in Bern. Kaiserslautern is an easy one. You can see the ground from the station, so forget about driving here and come in by train. Most journeys go via Mannheim. Frankfurt: 1hr 35mins direct, (2hrs via Mannheim). Leipzig: 5hrs 10mins (via Mannheim and Frankfurt). N�rnberg: 4hrs 10mins (via Frankfurt). Stuttgart: 1hr 40mins direct, (2hrs 10mins via Mannheim). The nearest airport to Kaiserslautern is Frankfurt. Be sure of getting a room in Kaiserslautern during the World Cup Finals by booking online before you go. Kaiserslautern is not as famous as Berlin, Cologne or Munich, for tourist attractions, but there are still some interesting things to see and do. Close to France and Luxembourg, Kaiserslautern is Germany's westernmost venue at the 2006 World Cup Finals. Built between 1875 to 1880, the Palatine Gallery focuses on painting and sculpture from the 19th to 21st century. Built in 1740, Kaiserlautern's last remaining timber-beamed building (located on Schillerstrasse) is now a public house. The website is not up to much but at least you get to see a picture. If you feel a little disappointed, just remind yourself that you're here to see the football.